Nice family 3 bedrooms house is available for rent now, it is located in ‘Hillside Village’, a secure gated community. A house is located on 100 sq.wah land plot, with big private gardens, partially furnished and ready to move in. Kitchen room, and large living room with air-conditioning. Good sized bedrooms and fitted bathrooms. Outdoor living terrace and a single covered parking space. 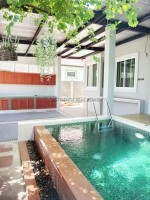 Hillside Village is situated in excellent location and located just off Sukhumvit Road. Plus a great location beside the new Tarapattana International School and is only a few minutes driving to Sukhumvit road and Jomtien Beach.